The Little Giant Premium Pond Pump is specifically designed to meet the high demands of continuous use with dependability and excellent energy efficiency. Capable of turning 1900 gph at 1 foot of head height, this pump is ideally suited for creating dramatic waterfalls with its 1/8 Hp direct drive motor. Its innovative design features a dual discharge to power two water features simultaneously if desired. For versatility, use the included cap to block one outlet and power only one feature at full water strength. Use both discharges to power two water features with a maximum rating of 950 gph per discharge at 1' of head height. The removable pump stand will keep the intake off the pond bottom to prevent frequent clogging. 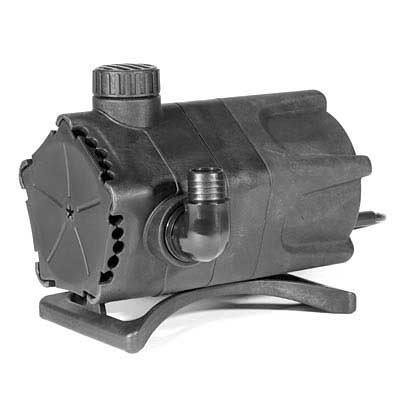 The pump is equipped to accept 1.25" MIPT threaded fittings and includes an adapter for fitting a 1" flexible PVC hose. Create exciting water features in your pond using this Premium Pond Pump. Three year limited warranty.